Nancy Nowacek Eyebeam Resident talking about the Citizen Bridge, her major residency project. She makes task-based encounters between bodies, things, and the space around them. Her work examines the relationship between late-capital post-industrial time-sense and body-sense, where physique has been eclipsed by other man-made machines as useful — or valuable — technology. We make bridges every day. From a hand-shake to a text, a friend request to an email introduction. When we write code, negotiate contracts or obtain insurance, or when we make a meal and sit down to together—we’re building bridges. Bridges expand our idea of what a technology could be. They link land masses to transport people and goods, but also connect cultures to one another, transporting ideas and values. Citizen Bridge is a kind of bridge in reverse. For several years now, I’ve been building a bridge between Red Hook and Governors Island. With the help of a long list of contributors and collaborators, I’ve designed several versions of a modular system for a temporary floating structure that can be built by anyone who wants to join in. A sand bar used to connect these two bodies of land, and rebuilding that sand bar together—even if it’s only for a day—would be my offering towards building a truly connected city. Bridges, as we normally think of them, are agents of political will, and require large corporate structures with vast resources to construct. They are permanent monuments to ideas of progress rooted in time and space. But this one has been the aggregate of email introductions, handshakes and small talk, texts, tweets, phone calls and lunchtime conversations. So many meetings and documents. If I printed the emails generated by the project to date, they would stand at least as tall as me. But every time I step into a generic governmental conference room to talk through policies and codes under the flat light of fluorescent bulbs, I feel strangely empowered. Before now, I’d always considered citizenship in terms of the Pledge of Allegiance—a grand and abstract idea of a nation so vast that it didn’t seem to see me, as a single, small person. Although in kindergarten I recited the Pledge of Allegiance every morning, and as an adult, I exercise my right to vote and I (struggle to) pay my taxes, the bridge makes me feel different. Citizenship is the space between people. It’s about our allegiance to each other, as people, not to the abstraction of a country. Though the internet and mobile technologies are bridges, they sometimes lose subtlety through their virtuality, pile up misunderstandings, and split the attention. They build bridges, but people never seem to cross them all the way: what happened to getting coffee and hashing out a plan? Citizen Bridge is worth every minute spent waiting on subway platforms and in reception areas. It’s been built from a thousand tiny bridges between enthusiasts, experts, students, neighbors, lawyers, engineers, educators, bureaucrats, architects, writers, and artists. The bridge-building I call Citizenship is best performed IRL. And we have to do it not just with our eyes or keyboards, but our whole beings. It is the care and consideration we show for one another, the space between us. And we—as citizens—are nothing without a shared environment to call home. And in the 21st century of shifting climate realities, we need to start considering our environment as another body that must be cared for. In New York City, our environment is our waterways and given near-future predictions, our city is sinking. The 580 miles of water that ring the boroughs are going to become more and more present in our lives in the coming years in ways we are only beginning to understand, and we don’t know what to do with it all. Up to the mid-1900s in New York City, life was lived on the water. It was our food source, our bathtub, our commute and our economy. All New Yorkers shared it. Today, at best, the waterways are an inconvenience—a space to get over or under. The water is still viewed as so toxic that ‘No Swimming’ signs line the few sandy inlets where feet can actually touch water. More superstorms like Sandy are predicted though many still have not fully recovered from her. We have lost our connection to the water. And because of that, we’ve lost our shared experience of this city and one another. 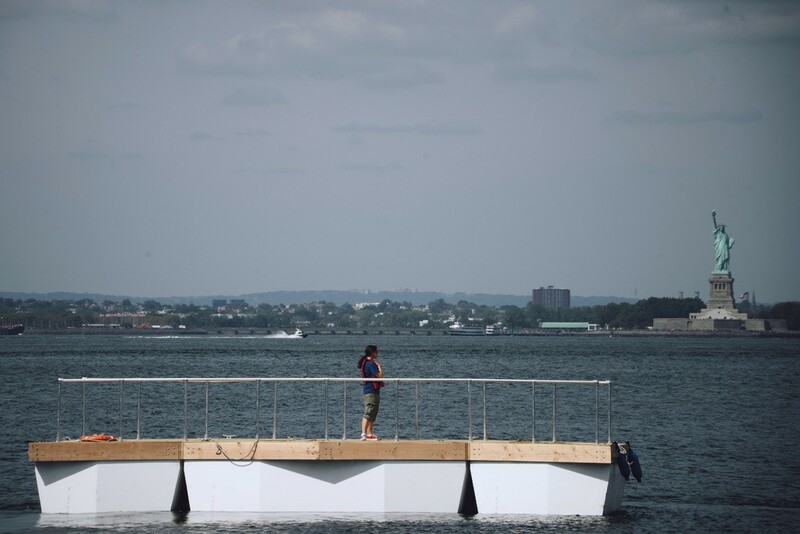 Citizen Bridge hopes to be the handshake, the introduction towards a shared experience: one between one New Yorker and another, and between New Yorkers and the water. Because Citizen Bridge proposes to span Buttermilk Channel, a commercial shipping thoroughfare, regulatory agencies will only allow it to open for one day. On that day, you can meet me on the waterfront where I’ll be handing out a citizen pledge to sign. In triplicate, of course. I, , am a citizen of the water. I acknowledge that our natural environment and the city’s waterways are important to my future and the future of my family, neighborhood and city. I value working with others to realize ideas that support a creative, empowered and sustainable relationship to the water and our city. I believe that cities are acts of collective imagination, and that through cooperation and sweat, we can bridge our differences, and shape the future of our city.